Rainbows are easily becoming one of our favorite themes in my preschool classroom! We have been all about rainbows recently, and it been a great way to introduce the warmer weather (we’re in the south!) and the spring season. 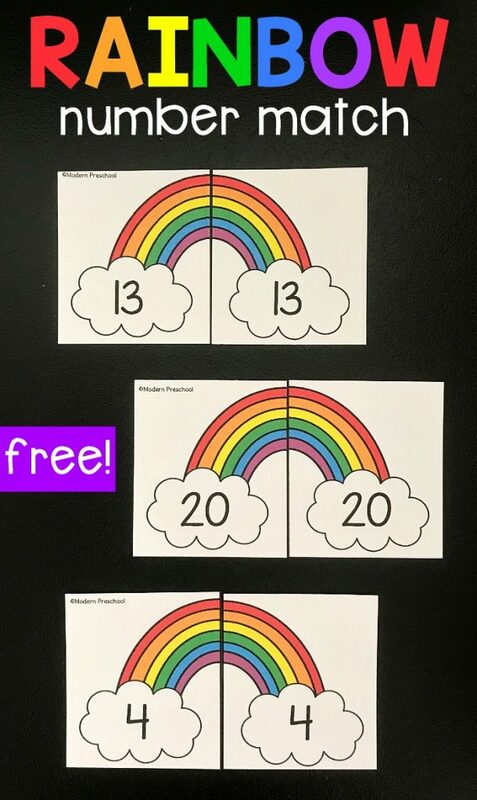 Our rainbow number match printable activity encourages number recognition 1-20 while using visual discrimination skills. This free printable rainbow number match activity for preschoolers and kindergarteners includes 20 rainbow puzzles. Each rainbow puzzle has the same number printed on both sides of the rainbow. The numbers included in the puzzles are 1-20. To prep the activity, print the set from the file below. Choose whether to print all 20 rainbows, just 1-10, or even just 11-20. Cut the rainbow puzzles apart on the gray dotted lines. Then cut the rainbows in half down the black line. If you are laminating the set, I prefer to laminate and then cut down the black lines to separate the rainbows. In my preschool classroom, I love to use the same activity in multiple ways to work with different leveled groups. The rainbow number match activity allows you to use the math learning center to fit the needs of your current learning level. Many of my preschoolers have mastered number recognition up to 10. They can also easily recognize numbers in the 20’s, 30’s, etc. It’s those tricky teens that really trip them up. To help those pre-k kids who need practice with the teen numbers, I will set the math center up to include numbers 11-20 only. 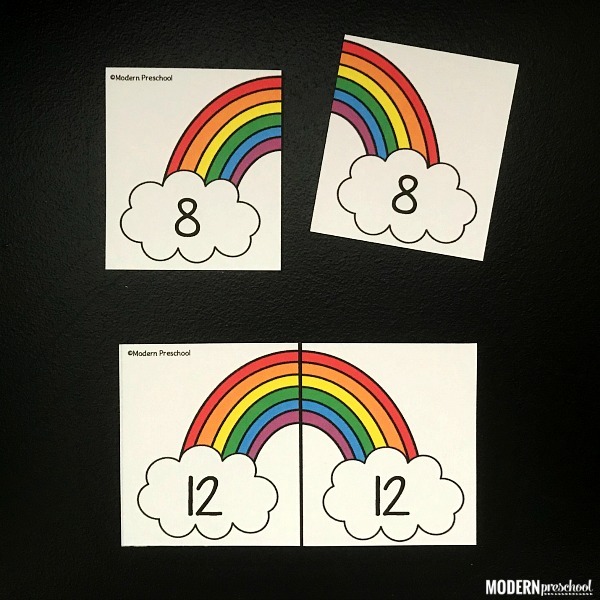 Pick a rainbow side, identify the number, and look for the other side of the matching rainbow. Using visual discrimination skills is important while learning both letter and number recognition. Seeing the numbers twice on each rainbow adds extra practice and focuses on how the numeral looks and is formed. To differentiate the rainbow number match activity, choose the numbers to use with the learning level in your small groups. I have a group that will use only numbers 1-10, a group that will use 11-20, and then another group that will use all of the rainbows 1-20! We are also working on correct number formation with my 4 and 5 year-olds. Sometimes I think writing numbers is the worst for little kids. There are SO MANY curves and twists, it’s almost not fair to those little hands that are still working on fine motor skill strengthening. So numbers are something we practice in many different ways. To work hand-in-hand with the rainbow number match, I have my preschoolers use our rainbow tracing numbers recording sheet. Put together a rainbow, find the matching number, and trace it! 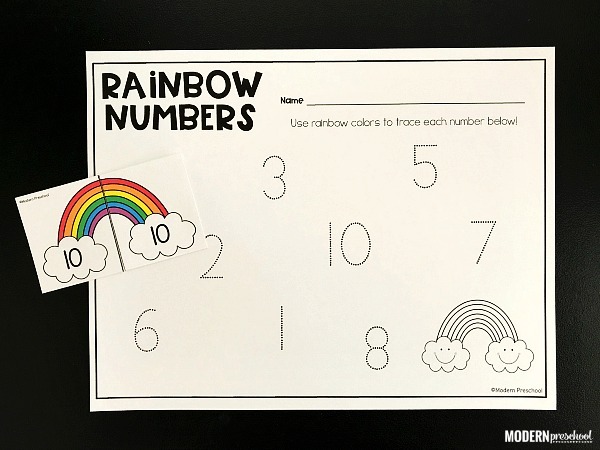 Pair the rainbow number match with the rainbow tracing numbers printable to extend the number practice in your math center! Now, for some exciting news! Our rainbow number match is sort of a preview sample of one of the activities in our Rainbow Fine Motor Busy Bins! These puzzles are similar to the linking number rainbows busy bin. The rainbow number match puzzles are bigger in size, which are helpful for little hands matching them together. The linking rainbows are the perfect size to hook together with plastic chain links. But both could be used for either activity! You can follow the link to find more details and pictures of the Rainbow Fine Motor Busy Bins. 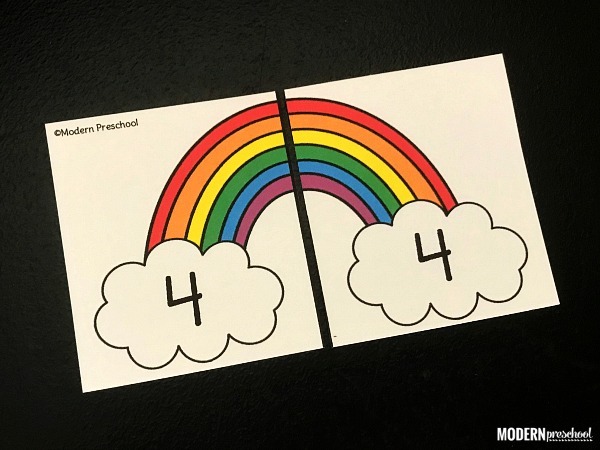 Print the rainbow number match activity now!